Parrot has introduced a new drone, the Parrot Disco Drone. With this new fixed-wing aircraft with a single 8-inch rear propeller, it provides up to 45 minutes of flight time, automatically takeoff and automatic landings which is perfect for beginners but also offers all of the advanced features that more experienced pilots are looking for. Parrot has traditionally only produced quad-copter style drones and the new Disco drone will be the first from them which offers a more airplane style drone or UAV. The body of the Disco is hard foam which is built up around the plastic frame. The wings easily come apart for easy transport and easy replacement if they are damaged. You’ll find all of the other features that you would typically find on a Parrot drone such as GPS, auto-return to home, automated way points, and even an auto pilot that would prevent new pilots from causing harm to the aircraft which could make it crash. Also, like other Parrot drones the Skycontroller can be added to provide up to 1.2 miles of controlled flight distance. You also receive real transmitter style buttons and control sticks for a more realistic experience if virtual buttons on your mobile device isn’t for you. The Parrot Disco is still in final prototype testing on display as CES 2016. The Disco has a 45 min flight time, weighs 700 grams, and pricing is still not yet known. 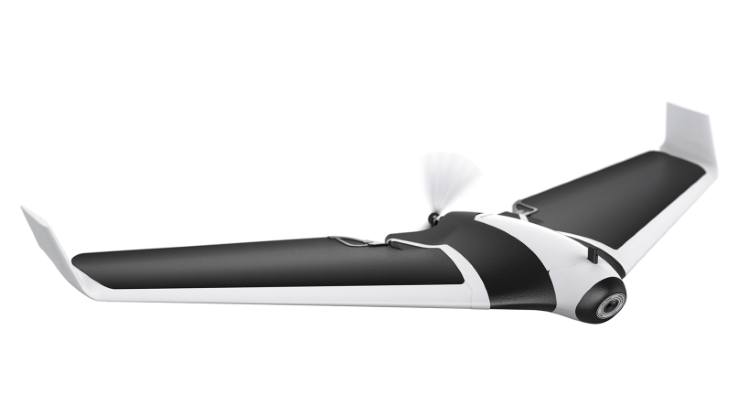 Parrot has said it will bring the new drone to the market in 2016 and if we had to guess it would be Q4 of 2016 as the release date, just in time for the Holiday shopping season!